Changed to default option optEM.heavy_tailed = true and added the option optEM.robust_mat to handle cases when the sensing matrix gives issues. Cleaned up GAMP warm starting to account for adaptive step size. Now user can alter GAMP and EM options without knowing all other defauls. For instance, if one wants to decrease the EM tolerance, they simply need to do EMopt.EMtol = 1e-5, and then call xhat = EMGMAMP(y,A,EMopt). Switched the order of GAMPopt and EMopt as input parameters. Decreased GAMP iterations to 4 and increased EMiterations to 60. 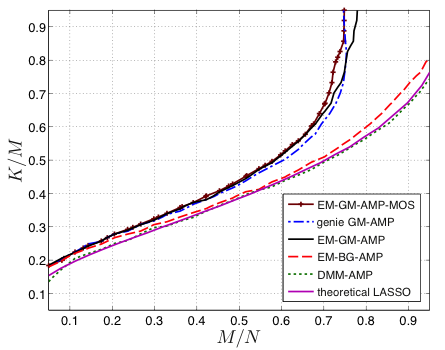 Added the EMGMAMP Model order selection (EM-GM-GAMP-MOS), which automatically selects the number of GM components L. To call simply use xhat = EMGMAMPMOS(y,A). Added option for estHist output. This structure contains per-iteration GAMP quantities such as the step size and the cost function. Updated for the Complex and MMV cases. Now code is included in the GAMP sourceforge package (See download section). plot_GM - Plots the estimated pdf for real or imaginary case. EMGMAMPdemo - Updated to show plot_GM's usage. Updated error checking and miscellaneous bugs. First release of the EM-GM-GAMP algorithm. plot_GM - Plots the estimated pdf.